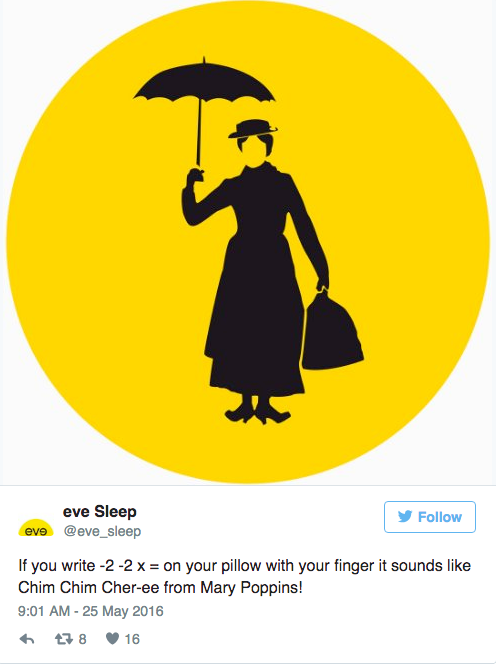 If you live in London then you’ve probably noticed the harmoniously yellow Eve Mattress campaigns lining tube car panels. If you’re a fan of the telly box, then you will be aqcuainted with the cosy pyjama-clad hippo of Silent Night fame. And you cannot have missed the unrelenting batch of bed-bouncing children in showroom ads, every. single. sale. season. As proven above, mattress marketing is far from forgettable. After all, they’re not just for sleeping on. It’s an exciting time to be in the bed business. The advent of technology has moved the mattress market out of the showroom warehouse and on to the web. The removal of the 'middle man' has meant smaller costs and greater choice has fertilised even greater competition, and therefore, the need for better marketing to differentiate brands in a crowded playground. 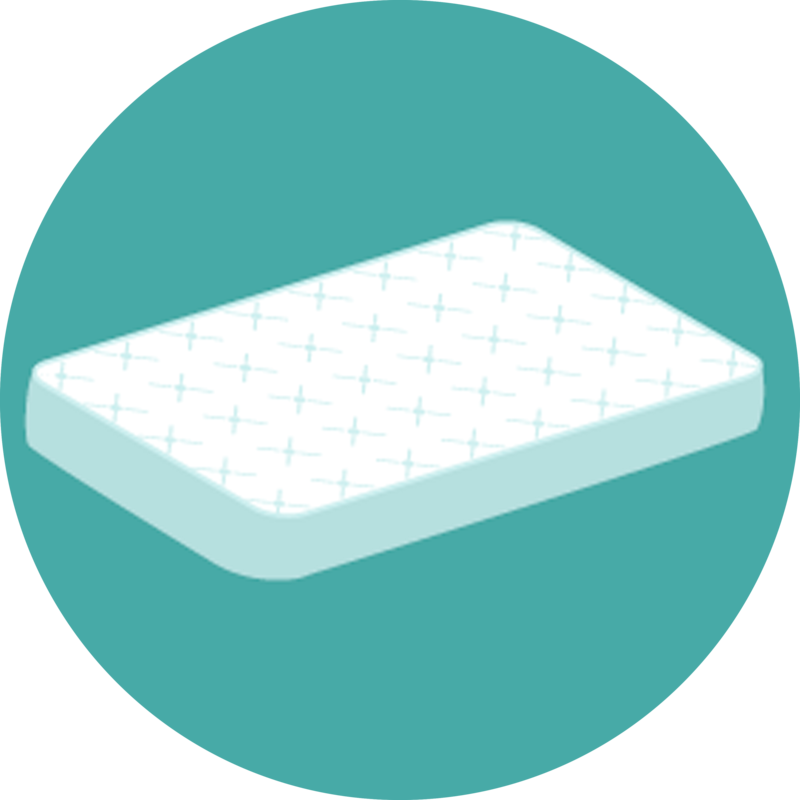 New online-only startups have sprung up all over the web, offering a revolutionary mattress-in-a-box, direct-to-consumer business model; with 100-day try-before-you-buy trials now a hallmark of the industry, thanks to pioneering companies such as Eve Mattress, et al. We've been busy exploring, subscribing and admiring mattress marketing - from email to social, vloggers to bloggers - in a bid to bring you some top-notch lessons. Tuck in and relax (but no snoozing). 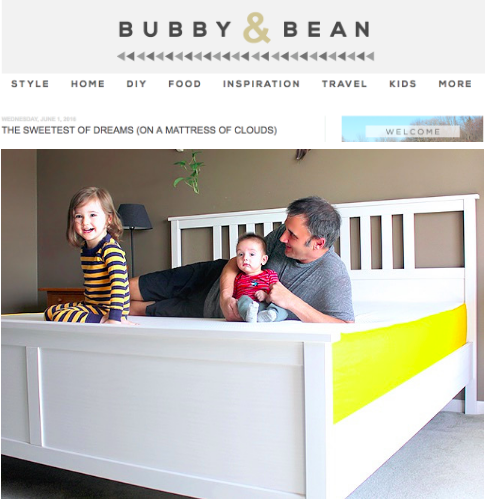 *NB although it's not strictly a mattress-only brand, their storytelling is epic, and should be admired. One very effective way of distinguishing your brand from others is with great storytelling. Fit for Swedish royalty, at the cost of nearly $70,000, a mattress from Hästens is the stuff of dreams. Unless you're a king, a duchess or loaded. BUT, it doesn't mean that we mere paupers can't take anything from the brand. Their rich history and roots with royalty has given it a wonderful story to tell. 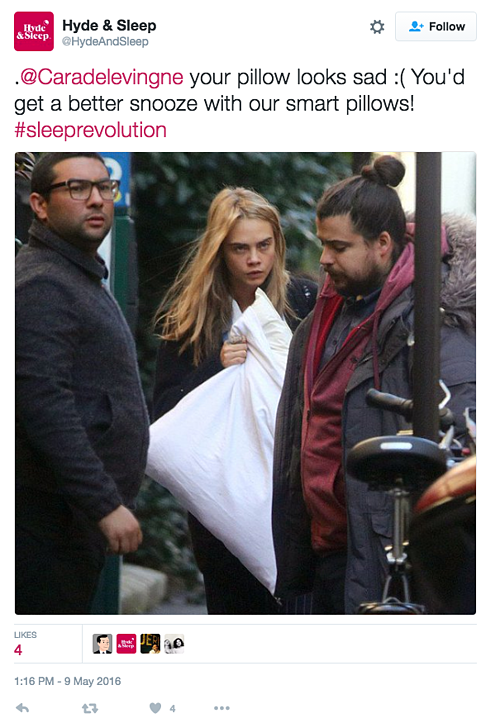 Which is what you'd expect from the "world's most exclusive bed company". 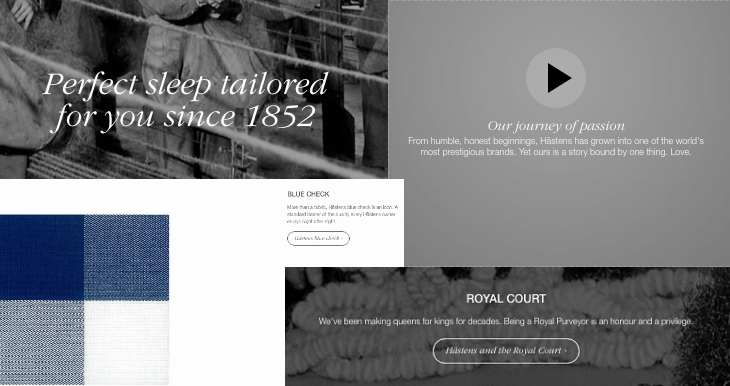 The slick Scandi company's our story page harks back to its ancestral beginnings, its royal connection and the love story which united the company and drove it forward into its present day success. Good online storytelling is essential, especially for online-only players trying to differentiate themselves in a cluttered arena. Hästens plays on its rich history, a love story central to its brand and its unique association with royalty to paint a rich, dynamic and human brand that makes you want to be part of it . It's about giving a brand authenticity, breathing life into the bones of an otherwise baron online environment, to forge connections with consumers that live beyond a simple transaction. Talk about your roots. Build your brand out of passion and people will feel it. Focus on values. These values resonate with your target market and reinforce your brand image, helping consumers align theirs with yours. Use rich media to create an immersive experience - aim to delight people. Sell an experience. People buy into experiences, we all want to feel something. Focus on a key proposition - answer 'why us over them?'. High attention to language and copy. Is what you say emotive? Does it sound authentic? Is it in line with the rest of the brand? Focus on brand evolution. Instilling a sense of 'hey, I'm on a journey just like you' can make your brand seem a lot more personable. 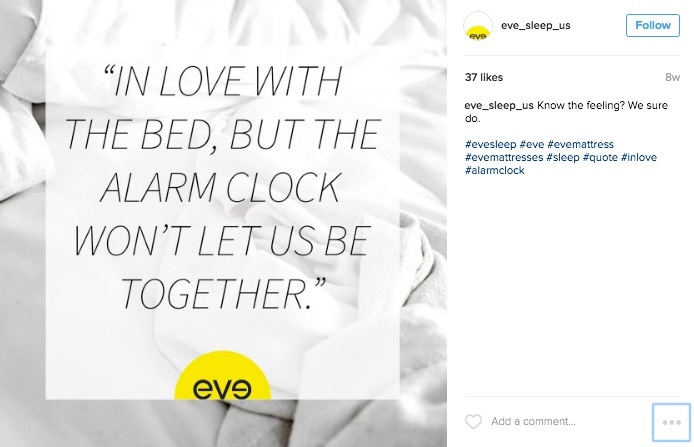 One mattress brand owning social right now is Eve, who manufactures a single type of mattress in several sizes and shapes with the direct aim of taking customers from top-selling memory foam mattress maker Tempur, by "selling its products for a fraction of the price". Their website even features the tag line, “somebody’s going to lose their Tempur", a funny dig that ripples through its social profile, reflecting the brands cheeky, informal tone. Not content on acing its social voice, Eve also uses the powerful platform to convert sales. Let's explore. Tone of voice is an expression of the people behind the brand. It is everything. We all forge connections, opinions and lasting impressions (or not) of the people we meet based on what they say and how they say it in those first tentative moments. The same is true for online. Tone of voice both embodies and expresses the brand’s personality and set of values in a way people can easily consume. Eve conveys its relaxed, witty and personable tone very well on its Twitter channel, which is chock-full of curiosities. This simple tweet above featuring the main matriarch (apart from blowing your mind) is a perfect reflection of the brands personality (and its colouring is so on-brand it almost hurts) leaving the reader with an emotional experience. Not just your average tweet. Eve posts beautiful, magazine-style editorial snaps of its products on its Instagram account in a bid to connect its brand with its audience and tap into the lifestyle community that call the photo-tool home (which is all woven together with its familiarly hypnotic brand yellow). Social isn't just for expressing ones self. It can sell, a lot. Facebook is currently dominating the social-selling pack, scooping nearly 65% of social network ad revenues last year, scoring a 1.85% conversion rate (according to Shopify). In fact, spend on social ads jumped 86% year-on-year in Q1 2016, according to Kenshoo, signaling a rising reliance on social selling. Take Eve, who used custom audiences to convince new subscribers to shop with this proposition ad: highlighting their free delivery, 100 night trial and 12-month payment plan in bid to drive sales. The world's biggest social tool is the perfect place to target yet-to-purchase subscribers. Online retailers should try segmenting new subscribers into a list and target them through custom audiences to educate them about brand USPs and keep brands alive in the prospects minds eye. Being social is about being seen and heard, everywhere. Eve taps into the world's biggest video-sharing platform as a place to educate viewers about the simplicity and ease of its product, acting as both an educational and a promotional push - making the video shoppable. As online retailers plow more of their marketing budgets into content creation, ensuring that this content contributes to making sales rather than distracting customers from the business of buying stuff is a key priority. Be consistent in your use of language, image and presentation so that your social profile becomes familiar to the customer. Be distinctive to set yourselves apart from the rest. Social is cluttered, be different. Tone of voice is great. But don't forget you're in the business of selling. Add a ‘shop the look/view the collection/buy now + hyperlink’ call to action in order to link your voice with your shop. Be yourself. Shoppers want brands to be authentic, personable and human. Casper, the friendly mattress company, brings millennial simplicity to the sleep space. Its sleek, denim-lined latex and memory-foam mattress won the investment backing from the likes of Ashton Kutcher, no less, and its email marketing is just as pretty. 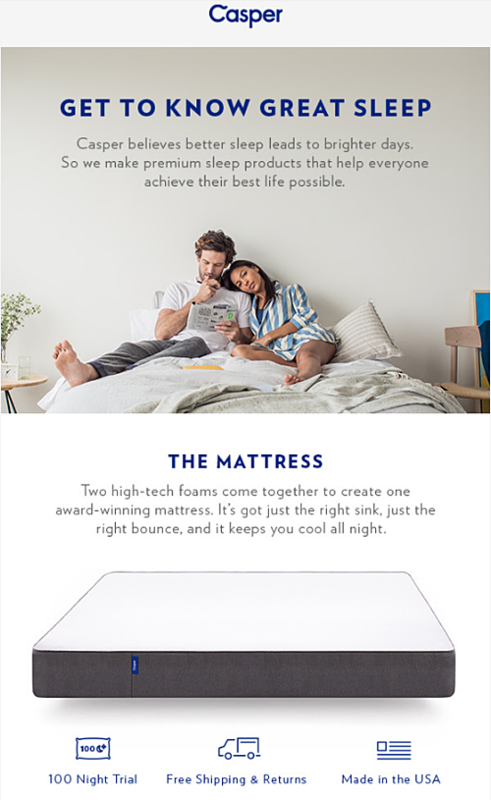 First in the welcome series, this email works to introduce new subscribers to the brands key proposition - the mattress - highlighting its USP's (100-day trial, free delivery, etc) while introducing the customer to its cool image and healthy-sleeping attitude. Number two works to drill home the "100-day night" trial, in a bid to tempt new prospects to give it a go, with "no springs" attached. 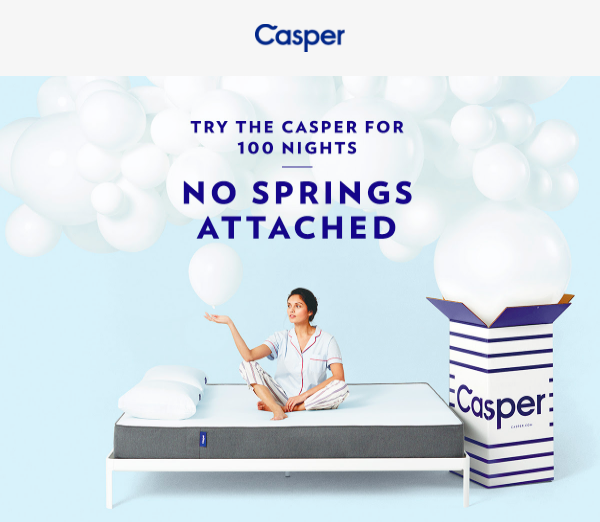 Last and third in Casper's welcome series, this email works even harder to convince new prospects to convert, showcasing (in plain English) the benefits of joining the brand with "three fun facts" about Capser. The email highlights payment options, the trial (again) and links to its customer service team AND a production video - which helps consumers understand the quality and proposition of the product. Set subscriber expectations - news, offers, promotions - outline the kinds of emails you’ll be sending subscribers, and how often. Make it clear who your welcome emails are from and what they’re about. Make sure your welcome series conveys the breadth of your product offering. Does it incentivise subscribers to make their first purchase with an offer or gift? Have you considered personalising welcome emails to build rapport with new subscribers? A really good newsletter builds your brand, closes sales and grows your business. An even better one propagates your brand tone, image and identity. 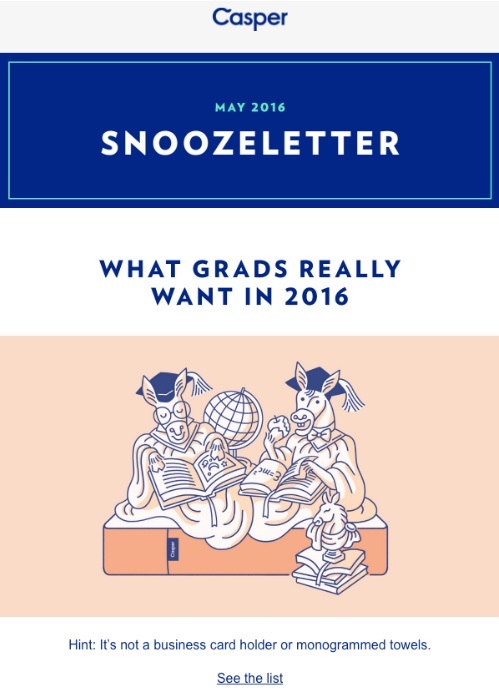 Casper's "Snoozeletter" does all of the above. Is it clear from the sender/subject line which brand the email is coming from? Does the newsletter have attractive images and strong calls to action back to the online store to shop? Make sure it links to social accounts! Have you given subscribers the option of tailoring their emails to make them more relevant? Subject line: Still dreaming of a better bed? When it comes to basket abandonment emails there is only one action that you really want the recipient to take. The CTA. But how do we get prospects clicking? Casper uses bold, clear text and humorous imagery to grab the attention of basket abandoners and get them back on-site. Timing is essential. Emails sent within 20 minutes achieve on average a 5.2% conversion rate (according to SaleCycle). Get your subject line right. Inspire curiosity. Urgency and questions help boost open rates. Remind customers what they’ve left behind. Be as specific as possible and Include an image of the product that they added to their basket, as people often respond better to images. Call to action. Ensure that your CTA is prominent, super-clickable, and that the copy is laser-focused. Try something like "take me back to my basket" or "complete my order". Incorporate your regular website navigation to encourage them back onto your site ready to buy something else that’s more up their street. Blogs serve many functions. They're crucial to boost your digital footprint via SEO, increase traffic, increase back links, generate leads, drive referrals and also help to improve the spice of your email marketing. Furthermore, they're vital tools to build and engage crucial community hubs, of which you can broadcast core brand values, personality and voice - and ultimately - connect. Silentnight's 'Sleep News' is full of lifestyle-related posts that relate to their wide range of customer's, from millennial's to mothers. Tailor the feel and design of your blog to suit your target market, to make sure it resonates with them (and keeps them returning). Content doesn't always have to sell. It can simply be a platform to showcase that your brand is perfectly aligned with its customers' world. Populate your blog with content that reflects your customers' interests and hobbies to make it somewhere worth returning to - and don't be shy of a subtle sell - linking relevant posts to product pages in a non-invasive nod to your ecommerce site. 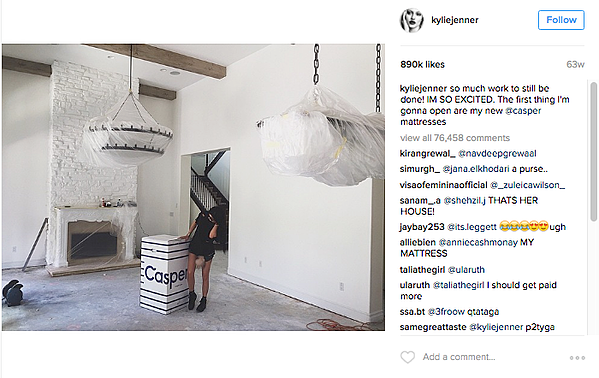 In other news; it didn't hurt Casper to get one of those Kardashian's involved to help target that lucractive millennial market (she has 62.9m followers, with each post typically attracting 1m likes). Partnering with popular social media stars to reach vast audiences who already shop is a wonderful way to boost engagement and sales - if you've got the budget. 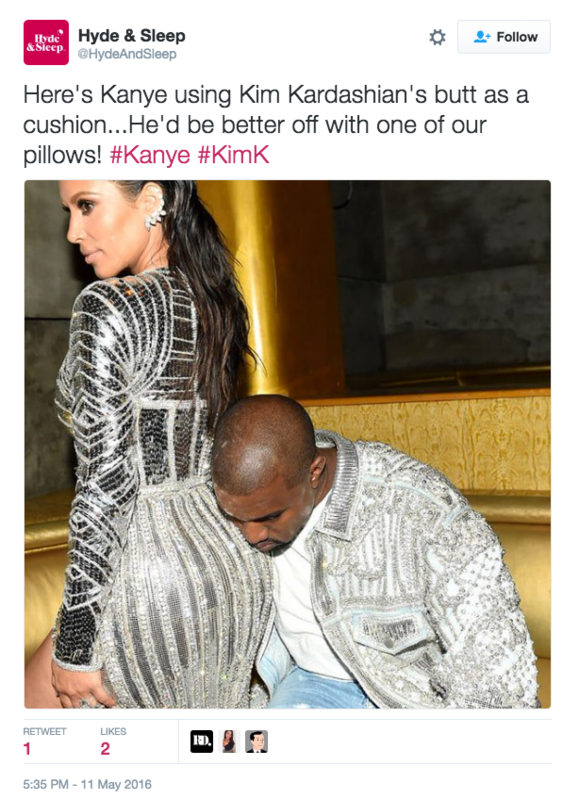 Similarly, exploiting the social reach of celebs such as Kanye (see example below) will help your brand seem relevant, part of the conversation and reactive to popular culture - helping to paint a dynamic brand personality that your followers can relate to and become part of. Oh, and it's free. Just take Hyde and Sleep's Twitter channel, for example. Connecting your brand with the community around you is essential in order to bring your product off the shelf and into the real world. Partnering with social influencers, whether they be famous, or key bloggers, well-positioned in your target market is a great way to humanise your brand and bring much-needed social proof to the charms of your product. Humans trust other humans more than big brands. Fact. And vloggers are the undisputed kings (and queens) of the YouTube playground and beyond, and brands are fast wising up to the benefits of having a strong vlogger relations strategy in order to humanise products. Leesa has aced its vlogger-vibe by calling on key commentators within its target market (i.e. mums and families) and promoting their kind words through Facebook's increasingly popular Dynamic ad function. Leesa collaborated with vlogger/blogger star Cora, an "interiors obsessed mama of twin toddlers" in order to bring their mattress into the home of their target market. According to research, 63% of consumers indicate they are more likely to purchase from a site if it has product ratings and reviews. When it comes to ecommerce, building social proof into your website is incredibly important; being able to witness approval from other consumers can give online shoppers that all-important nudge in the right direction. 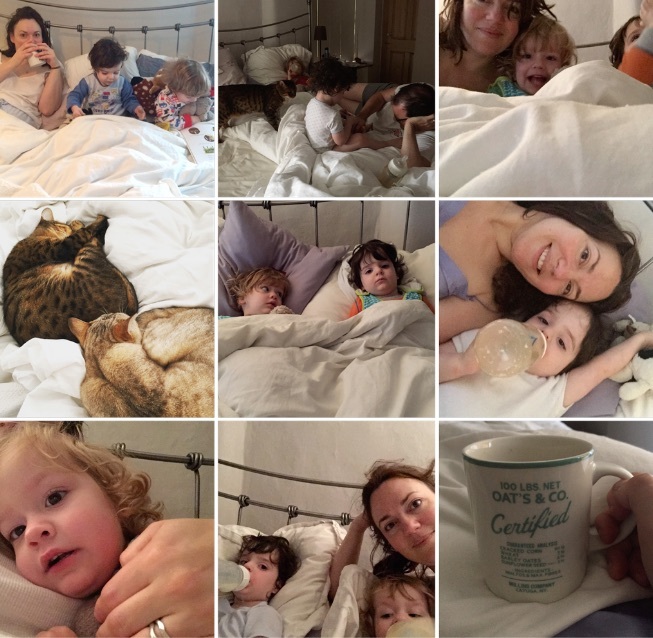 Just look at these pictures and tell me you don't want to a) start a family b) cuddle a cat c) have a cuppa and d) buy a mattress from Leesa. Although reviews are perhaps the most obvious form of social proof, it can take many different forms, such as celebrity endorsement, bloggers, vloggers, badges and awards, etc. Social proof is vital to build trust. Today’s consumers are shrewd; their trust hard won. Utilising social proof is a great way of winning round those who are sat on the fence. 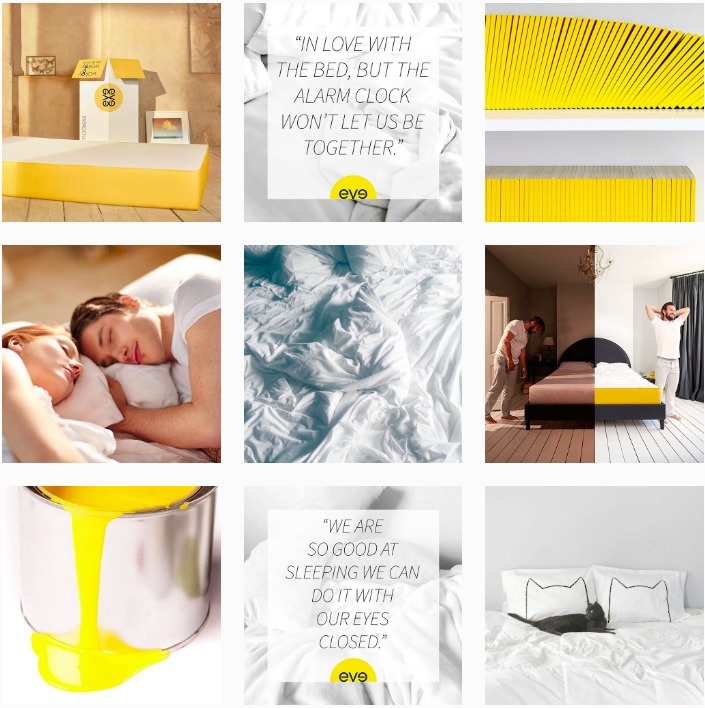 Online mattress companies have embraced social proof, utilising the power of communities to lavish brand trust and recognition on to their target markets. Influencer marketing is big business. Forging and fostering relationships with influential bloggers is an essential strategy in a consumer world increasingly driven by social proof. Be sure to capture action: highlight and share great photos and experiences of 'life happening' to make your brand is relevant and part of the current conversation. Which celebs appeal to your target market? Engage brand advocates by asking your fans how they feel about a new product, store opening, or social event, then recognise them for giving you input to create an active audience. Give your customers a reason to share your content by creating something unique or funny that is one-of-a-kind and special. Flat pricing, free shipping and returns are stealing customers away from the showroom. Companies like Leesa, Casper and Eve have sites tailored for smartphones that require a few clicks to order, often aimed at the wealthier, younger and busy shoppers who care about convenience. And it is with this online-only, busy, convenience-seeking shopper on which their marketing rides. Retailers can take many leaves from online mattress companies' marketing. The need to stick out has meant mattress distillers are on their game: with high attention to storytelling, social tone, social proof, email marketing and brand image. 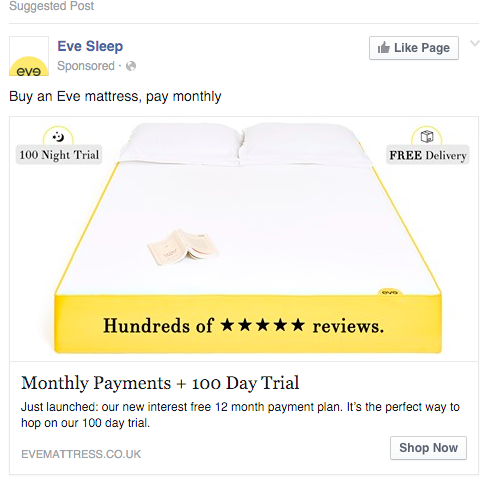 So, next time you need some inspiration, think about mattress marketing first. Mattressomics, perhaps?